History of the Lindneux Art Publishing Co. There are many other examples of Robert Lindneux art in other museums, the museums listed here all have Lindneux paintings in their collections and may display them from time to time. Whether or not you are able to see a Lindneux painting, all of these museums are well worth a visit. 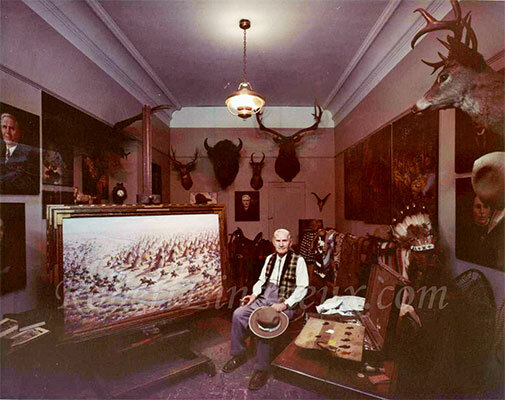 This is a photograph of Robert Lindneux and the collection of art and other memorabilia which he donated to the Colorado Historical Society late in his life. The History Colorado Center (formerly the Colorado Historical Society) houses several of Lindneux’s significant historical works including Sand Creek Massacre, (shown in the front in the photo above) Beecher Island, Thornburg Massacre, Camp Weld and Fort Lyon. They also have other distinctive examples including the allegory Death the Victor, and his only two “modern” works which are cubist style renditions of The Grand Canyon and Moose Lake. If you are interested in the history of Colorado we encourage you to visit the Colorado History Center in person or the History Colorado website. Another History Colorado museum, which displays Lindneux’s portraits of Chief Ouray and his wife,Chipeta, is the Ute Indian Museum in Montrose, Colorado. 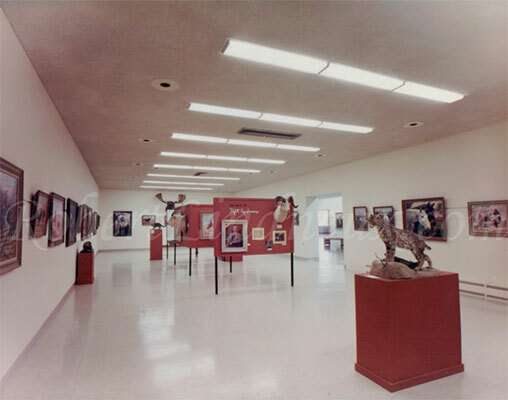 This is a photograph of an exhibition that Robert Lindneux had at the Gilcrease Museum, (we think it is the 1964 exhibition) . Lindneux had two exhibitions at the Gilcrease Museum in Tulsa Oklahoma, one in 1956, and the other in 1964. The Gilcrease collection of Lindneux works includes some of his most exceptional works in quality, color and subject. One of the better known works is a portrait of a Navajo chief called Shepherd of the Hills painted in 1928. Interestingly, Lindneux did two other versions of this work, a second but different portrait in 1930, and a third as part of his “Artist on Scene” series of Lindneux painting the impressive chief. This is a must see stop for art lovers. You will also find in Tulsa, Oklahoma the Philbrook Museum. This is another exceptional museum for art lovers to visit and it has a wide variety of art genres, periods and styles. They have two of Lindneux’s “Artist on Scene” series works in their vaults. While it isn’t likely these two paintings will be on display, we highly recommend that anyone with a more diverse interest in art visit the Philbrook. 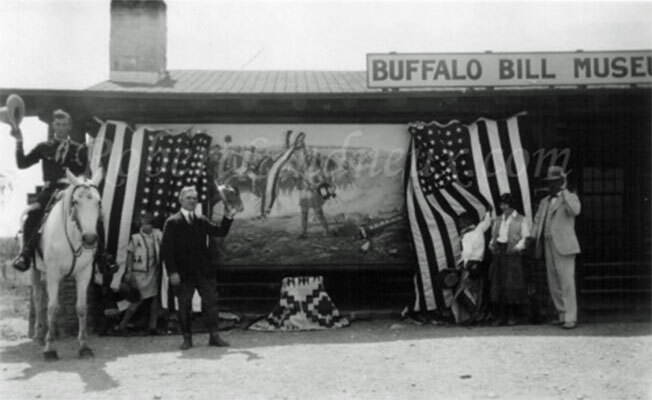 This is a photograph of the unveiling of Lindneux’s strongly criticized and debated depiction of the First Scalp for Custer at the Buffalo Bill Museum in Cody, Wyoming on July 27, 1928. The Whitney Gallery of Western Art at the Buffalo Bill Historical Center in Cody, Wyoming houses the 6 foot by 14 foot First Scalp for Custer. A painting that depicts the duel between Buffalo Bill and the Warrior Chief Yellow Hair which took place on Warbonnet Creek, South Dakota, on July 17, 1876. This event has been depicted by many artists, including Lindneux, and historians often debate over the imagery used. This is another must see location for anyone who would like to learn more about the life and times of William F. Cody. All images, text and other material on this web site are copyright Christina Millard Smith and Robert Lindneux Millard Jr. or of other descendants, individuals or organizations as specified, and may not be used without permission. © 2009-2016 Christina Millard Smith/Robert Lindneux Millard Jr. all rights reserved.